At least 88 people have been killed and another 44 are missing in the wake of flooding in southern China over the last week, state media say. About half a million people have been evacuated because of the flash flooding, caused by heavy rain. The downpour has swollen rivers including the Pearl river in Guangdong province, a manufacturing hub. China's rainy season, which began in May, follows the worst drought in a century in the south-west. State news agency Xinhua reported on Saturday that the heavy rains had caused landslides that have killed 35 people. Other provinces badly hit have been Fujian, Hunan, Jiangxi, Guangxi, Guizhou and Sichuan. The National Meteorological Centre warned of more heavy rain in the region until Sunday. 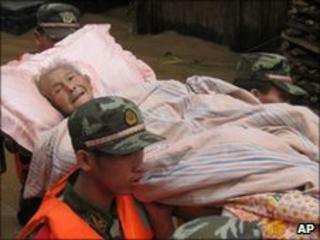 Pictures from Chinese state television, CCTV, showed people stranded on the rooftops of almost submerged homes. A number of highways and more than 33,000 homes have been damaged by the flooding, officials said.